It has taken many years of behind-the-scenes work for Bill Esparza of Street Gourmet LA to plan and create the first-ever “Tacolandia” Sunday, June 23 at the Hollywood Palladium (the event is sold out). Presented by L.A. Weekly and curated by Esparza, more than 30 food vendors, some as even far away as Baja, Calif., are bringing their “A” game showcasing what Los Angeles is known best for — tacos. One of the main sponsors of Tacolandia, Goya Foods, will be serving their salsas and three bean salads demonstrating just how delicious they are with your favorite tacos. Goya has graciously offered our readers (2) general admission tickets to the sold-out event. See below on how to enter to win. If you win these tickets or were one of the lucky ones to buy your Tacolandia tickets early enough, please visit the Goya booth to sample the salsas and bean salads. We found Goya’s Tangy Three Bean Salad a perfect accompaniment for our carne asada tacos. It’s even hearty enough to eat by itself for lunch, as it packs a huge protein punch. We added the serrano pepper because we like heat, but you can omit the chile pepper. The salad is also perfect to take to a summer BBQ potluck as there is no mayonnaise or cream and can sit out for a while. 1. 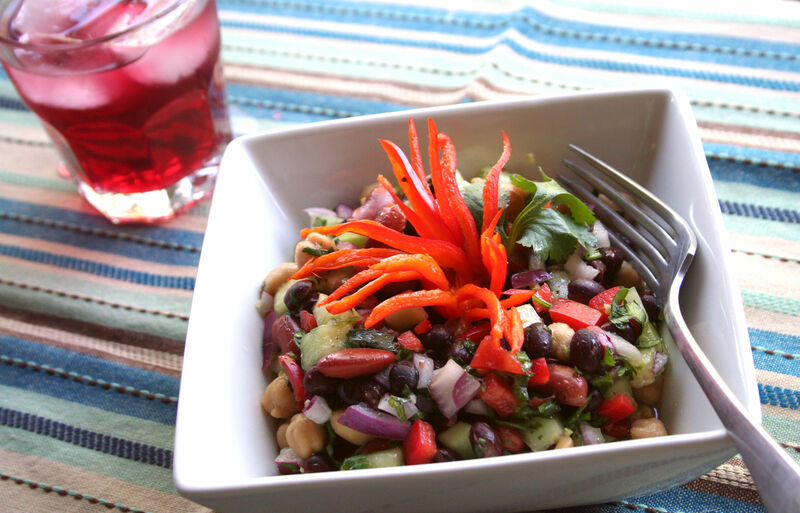 In large serving bowl, mix together black beans, chick peas, kidney beans, cucumbers, peppers and cilantro. 2 In small bowl, whisk together vinegar, salad, vegetable seasoning and lemon juice. Slowly drizzle in olive oil, whisking constantly, until blended. Pour dressing over bean mixture. Toss well to coat completely. “Like” the Goya Facebook page here.